QUINCY — For 30 years as a painter in the city’s public works department, James Pantages spent his days applying fresh coats of color to trucks, municipal buildings, and city equipment. 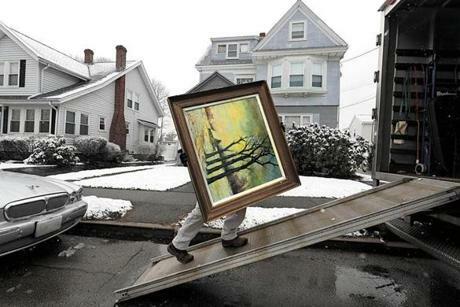 And when he wasn’t applying paint, he was buying paintings: spending weekends at area flea markets, art galleries, and auctions scouring for humble treasures he’d squirrel away in the ramshackle three-story home he shared with his mother for roughly 60 years. 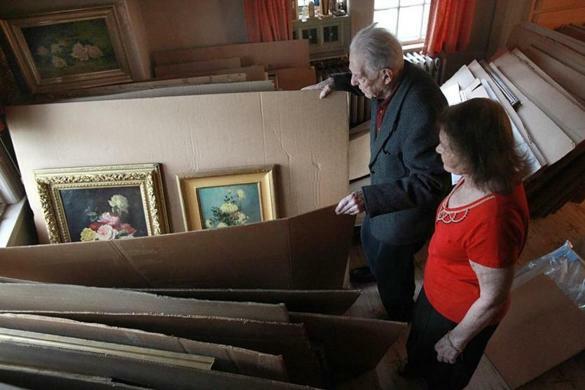 But when his 96-year-old mother entered an assisted living facility earlier this year, Pantages, 69, was finally forced to reckon with what had grown into an unwieldy collection: a sprawling hoard of some 1,200 objects that crowded every inch of their home. Pantages, who retired in 2002 and is now moving into a smaller place, is working with appraiser Peter Smith, who last month began systematically removing and cataloging the collection, a portion of which is slated for sale this September. James Pantages’s three-story home was filled with 1,200 artworks. “It just mushroomed, like an atomic bomb,” he said. Smith said they’ve gone through about 10 percent of the collection to date. “We could be looking at a $1 million collection,” he said. Though Pantages has an affinity for African-American artists, the Ashcan School, and tribal artists, his collection is wildly eclectic. 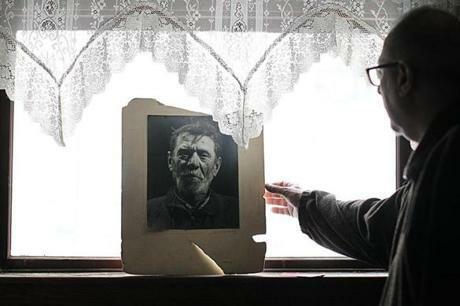 It ranges from the 18th century to the present, containing everything from 19th-century French paintings to a mythological work he said was executed by the notorious Mafia hit man Joe “The Animal” Barboza. Even so, there are certain blue-chip painters Pantages can’t help but covet, Picasso and Matisse among them. Although Pantages said he usually spent within his means, he recalled he once took out a $5,000 loan to buy a painting by the American Impressionist Colin Campbell Cooper. Although Pantages said there was once a woman in his life, they never married, and he quickly steers conversations back to his paintings: the color of one, the social commentary of another, the back story of a third, which he thinks once hung in Dustin Hoffman’s home. 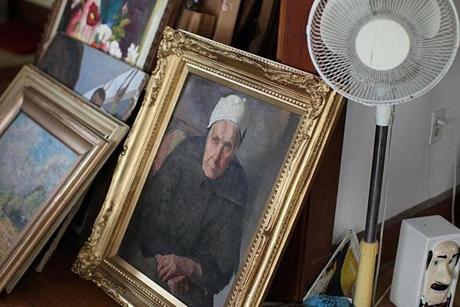 About half the paintings in his collection are unsigned. Many are unframed. Most need cleaning. Others need repair. And while Pantages has pored over art books and back issues of trade journals to identify some of the artists and works in his collection, Smith and his wife, Judy, an art restorer and researcher, are now working to confirm Pantages’s research. Pantages now says it’s time to downsize. So far, the Smiths say they have authenticated a group of works by some fairly well-known artists, including painters George Inness, Rockwell Kent, and Max Weber, among others. Still, there’s been a bit of push-and-pull with Pantages, who aside from attending a five-week course at an adult education center has never formally studied art — educating himself instead through books, magazines, and his own eyes. Nevertheless, the Smiths’ interest has been gratifying for Pantages, who used to stash his finds in the attic to conceal the breadth of his collecting habits from his parents. When his father died in the mid-1990s, however, Pantages began bringing some of his treasure out of hiding, first into spare bedrooms on the second floor and later throughout the house. 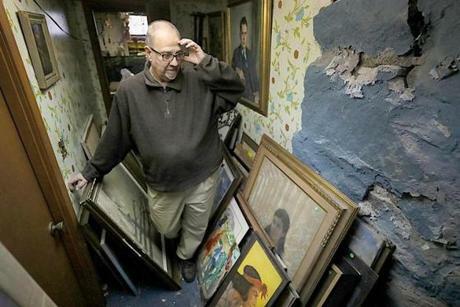 And though his paintings and sculptures would eventually spill into every room of the house, he said he continued to disguise the depth of his collection when his sister would stop by. But as his mother’s health declined, the family became more concerned about the sheer size of the collection, said Pantages’s niece, Joanne Salerno. Eventually the family began making plans to sell the house — a decision Pantages initially resisted, as the collection would have to be sold or relocated. In early March they reached out to Smith, whom Pantages had admired after reading an article he’d written about liquidating estates. Smith agreed to take a look, arriving at the Pantages home with Judy. As moving vans cleared out some of his last remaining paintings, he paused to reflect on a recent rainy morning. James Pantages has humbly amassed a collection of around 1,200 artworks over decades.